poppy seeds for the decoration. Warm 1 soup spoon olive oil in a big pan and stew the leek 2/3 there minutes. Add the dice of celeriac and both halves of the citronella. Add the broth and let simmer 25 minutes. Remove the citronella, add the cream and mix until obtaining a smooth soup. Adjust taste with salt and pepper. 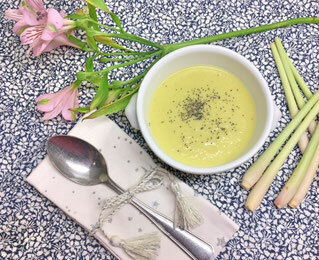 Mix 1 soup spoon olive oil with 1 coffee spoon curry powder and add it on top of the soup with a pinch of poppy seeds. Sudden post you proportion in reality i am regular fan of your web website and i look at this complete submit until stop and i without a doubt adore it very a bargain. i latterly came across your weblog and were studying along. I notion i would depart my first remark.